If you're looking for an attractive and powerful speaker with decent-quality Bluetooth audio and don't mind the odd quirk, the Luxa2 Groovy will work just fine. Just cover your ears when you switch it on. There's no shortage of portable Bluetooth speakers in today's modern wireless world, so it can be difficult to recommend one of the many over any other. But the Luxa2 Groovy Bluetooth stereo speaker is sounds good and looks sleek enough to set itself a few inches apart from the rest. 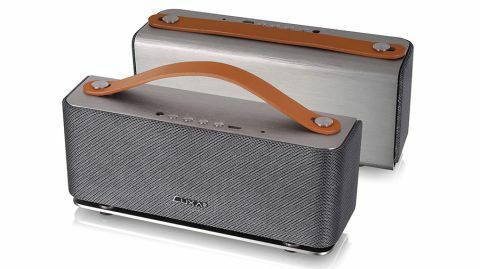 The Groovy is for someone who wants to fill a room or back yard with music from their smartphone or computer and look good doing it. Its accessories and clean build make it easy to haul around, and surprising battery life generally sees it through the day. If you frequently play music off your laptop's speakers, you'll find this to be a massive improvement well worth your $89.99 (£54.99, AUD $99). The Groovy is not for audiophiles, but that's not to say it doesn't do the job. On the contrary, it's more than adequate for most people's everyday listening needs, even if the packaging seems to it emphasizes style just as much auditory substance. The Groovy comes with two leather carrying straps (in tan and black), a carrying pouch, a micro-USB-to-USB charging cable (though no wall adapter), a headphone-sized cable for the AUX in port, and a quick start guide (but no full manual). Besides what's in the box, what exactly are you getting with Luxa2's Groovy Bluetooth speaker? Let's break it down. Luxa2's Groovy speaker puts out clean, high-quality sound, whether you're listening to your own files or streaming tracks on Spotify. And these days you can't judge a speaker by its size; audio aficionados should know this, but it bears repeating. The Groovy jambox can reach satisfying levels of volume, easily filling indoor spaces and blasting clearly across large outdoor areas. It's really quite loud. There are no built-in EQ settings, but the default levels are adequate and tuned well enough. The Groovy is somewhat lacking in bass, though that's not to say there isn't any. And it makes up for whatever bass it doesn't have with overall quality sound and the capacity to reach surprisingly high volume levels. The Groovy won't shake your fillings loose, but it can rock the party. The Groovy is has a pleasing minimalist design that looks great. It's all brushed aluminum and sloping curves, with as clean a face as any speaker you'll see, excepting the small but unassuming Luxa2 logo fastened there. The buttons and ports are all easy to access on top, and we loved how clicky and responsive they were. It comes with two leather carrying straps, in tan and black. They can be switched out easily or removed entirely. It's a small thing, but a little aesthetic customization, and the thoughtfulness of Luxa2 including a spare, goes a long way. And the included leather-ish carrying pouch is a nice touch, and it makes it easy to throw the Groovy in your bag or car without worrying about it getting scratched or damaged. Moving past aesthetics and into interface design, the Groovy can be difficult to figure out at first, as there are some irksome design choices. For example, the included quick start guide tells you that the LED light will blink alternately red and blue when the Groovy is in pairing mode, or turn red when it's charging. In normal use the light should be blue. But in our experience the light would sometimes blink blue or flash an odd purple color caused by both LEDs coming on at once, and it was unclear what the speaker was trying to tell us at those times. Also, pairing the speaker with a new Bluetooth device requires either holding down the power button, which also turns it off, or holding down the "answer call" button, which is not intuitive. And no matter how you do it, the speaker emits a really horrible screeching "beep" at various points, including when you turn it on or off. Lastly, when the battery gets low the speaker emits three soft "beeps" at regular intervals. It would be fine if it did that once, or every five minutes; but it squeaks at you with such regularity that you'll turn it off before it dies, just to shut it up. Those annoyances aside, we have to mention one more really nice touch in its speakerphone capability. If your phone rings while it's paired with the Groovy, a button on the speaker will answer the call. Since the Groovy has a bulit-in mic, you can actually take the call by talking to the speaker. Forget speakerphone, your call is now on megaphone. Battery life is where the Luxa2 Groovy really surprised us. The Groovy is advertised as having 3.5 hours of battery life at max volume, but what Luxa2 doesn't take into account is that you won't be listening at max volume unless you're throwing a rave. At a reasonable volume for listening at home, out by the pool or with a few guests over, the speaker's battery will last considerably longer. After a full charge, we used it on and off, for a few hours at a time, nearly every day for a full week before it needed to be plugged in again. All told we counted over a dozen hours of use, with the speaker powered on but not playing any music for a few additional hours. Once we let it die in the middle of a song it took a bit longer than advertised to charge back up - about four and a half hours, compared to the 3.5 hours promised - on our plugged-in Macbook Pro. Maybe it would have charged quicker if we plugged it into a wall socket, but the Groovy has no AC adapter in the box, just a USB cable. Once we became accustomed to the Groovy's Bluetooth pairing quirks we found that the speaker could pair with anything we threw at it, including a Macbook Pro, an iPhone 4, an iPad mini, a Samsung Galaxy S4, and a Samsung Galaxy Note 2. It's supposed to be compatible with all Bluetooth devices, and we found that to be true so far as our testing was concerned. That said, we'll never get used to that screeching noise. The Groovy can be a bit finicky when it comes to actually being detected, but it always worked after a few minutes of jiggering with our devices and restarting the speaker. And in case you don't already have a hundred or so 3.5mm AUX cables lying around, the included one makes it possible to play audio even from devices with no Bluetooth capabilities, through the good old headphone jack. The Bluetooth range is advertised at about 30 feet (10 meters), and that seemed to be the case. Putting a wall or a door in between your device and the speaker cuts that significantly, but that's to be expected. The overall sound and build quality, the included goodies like the straps and pouch, and the low price make the Luxa2 Groovy easy to recommend to anyone who needs a powerful and affordable speaker for casual use. There are some odd design choices, and the "beep" the Groovy emits when you turn it on and off is like nails on a chalkboard. But once you get used to its quirks they're easy to work around. If you're looking for an attractive and powerful speaker with decent-quality Bluetooth audio, the Luxa2 Groovy will work just fine, indoors or out. You could do a whole lot worse for your $90, just cover your ears when you hit the power button.